A new school year approaches this coming fall, also marking the starting period of sports athletics at the University of Houston. The past season was a wild one for the Coogs and we will go back in time and relive the upsets and heartbreaks the Cougars had. At the beginning of the fall semester school, students and alumni were both ready to watch their favorite student athletes play; volleyball and soccer were just getting started and fans were getting excited to see the first football game of the season; the “revenge match” in San Antonio against the UTSA Roadrunners – a grudge match after the Roadrunners beat the Cougars at the inaugural game of TDECU Stadium. Everything appeared according to plan until August 26th. Hurricane Harvey made his appearance and put the whole city and majority of south Texas under water. Every event was cancelled until it was safe for everyone to get back and try salvage what they could and get back to their daily lives. Volleyball worked hard in the off-season bounced back from their previous heartbreaking season, having gone 5-26 overall and 0-20 in conference and 3-13 at home. The 2017 season showcased a different squad of Lady Cougars; improving and doubling the amount of wins they had the previous year; massing a record of 12-16 overall, 8-12 in conference, and 8-7 at home. Soccer improved at home, but the struggles continued on the road. Good news for Coogs fans, the wins to loses rational went up from the previous year. By the rate they are going they will be even better than before. Football this year was a re-branding year. After the departure of Tom Herman and majority of the coaching staff, and a graduating class of key players leaving UH Cougar Football, the bell tolled for the next man up. It also marked the beginning of the Major Applewhite era. Even though there was a familiar face as the new coach for the Houston Cougars, fan base had his back. Season started off bad with the cancellation of the game vs. UTSA due to Hurricane Harvey. For the first game of the UH started off with a big win against Arizona. With close wins & loses and an upset against Tulsa the Cougars finished with a 7-5 record. With a good recruiting class transfer eligible to play a new coaching staff and currents players with experience under their belt, the Cougars look to take back the American Athletic Conference by storm. Houston’s swim team continued this season how they competed last season. They dominated the conferences and came back home conference champions once again. With a strong class returning this year the Cougars look to be 3 time champions. Men’s and women’s basketball also contributed to the excitement this past season. Women’s basketball – plagued by injuries – struggled in the 16-17 season, but with new a season coming on the horizon, the Lady Cougars look to start afresh this season. Chyanne Butler, one of the team’s leading scorer was out with a season ending leg injury. Guards Angela Harris & Jasmyne Harris came in to fill the gap left by Butler and stepped up in a big way; leading the team to a 20-win season – eight wins more than they had in the previous season. The lady Cougars finished 20-12 and a bid to the WNIT tournament. Men’s Basketball had one of their best seasons in recent years. The Cougars found some of the missing pieces in transfers Corey Davis Jr. & Zanna Jr., catapulting Houston with a 27-8 overall record – with big upset wins against ranked teams, Witicha St. and Cincinnati – and maintaining a perfect 15-0 streak at home. However, to Houston fans, it’s rough being a Houston Cougars as the Cougars made it to their Conference championship game but fell short with one play left. Not all was lost, however, as their performance gave the Cougars eligibility for the NCAA tournament, where they made it to the round of 32 with an upset lost to Michigan. Houston fans have something to look forward to. This team led by Coach Kelvin Sampson has a chip on their shoulder, they’re hungry and ready to get back and continue where they left off. Although the Cougars played all of their home games at H&PE Arena – home of the Texas Southern University Tigers – both, men’s and women’s, look promising for the upcoming season, making it more special with fans and players alike await the grand opening of their renovated home, the Fertitta Center. Baseball didn’t have a great season like they wanted but still a good season over all. When you’re used to seeing a team winning all the time and then out of nowhere they start losing it takes everyone by surprise. However, that’s not the time to give up. During those crucial times is when fans are needed the most to show even more support and help them get back to their winning ways. Houston Cougars Baseball were strong at home as usual going 22-6 but struggled on the road this season going 10-11 and 6-8 on neutral spots. Houston Baseball still finished 38-25, making a deep run in the American Athletic Conference Championship and get an invite to the 2018 College World Series championship tournament. They might be down but never defeated they will be back and ready next season. Softball isn’t far behind on consistency as they have been getting better with every season. This year was no different, the team had a winning record home, away, and neutral grounds. All Star pitching from Savannah Heebner kept batters swinging and missing, with a career high 150 strikeouts this season. Maya Thomas and Sarah Queen kept putting points on the board and making stops on defense. The Cougars have a big senior class next season, it’ll be interesting to see how their story will end. Houston Tennis made a big turnaround this year, going 20-4 and perfect 14-0 at home this was their best season since the 2014-15 season. The lady cougars are back on track. Women’s golf continued the way they finished last season, winning. The Lady Cougars won 3rd place in the 2017 American Championship and came back and won it all this season. Second time in three years Houston were crowned AAC Champions. Next season, fans can expect no different. 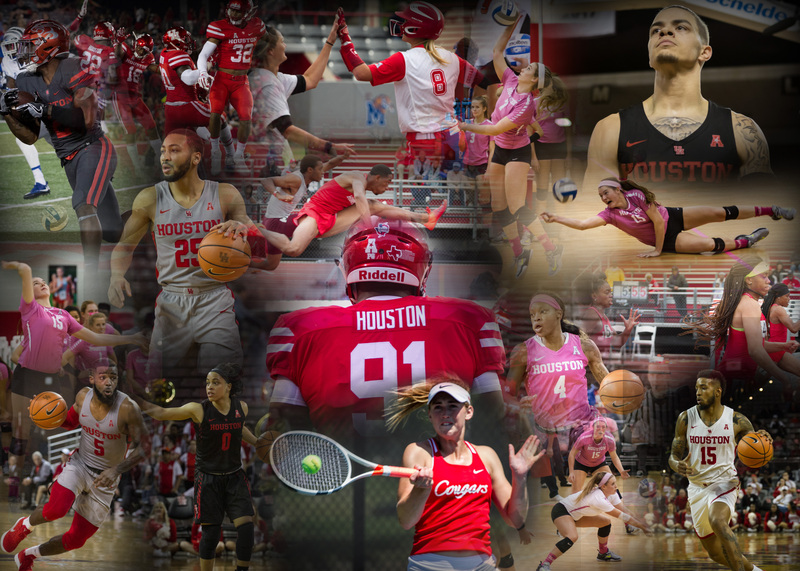 It’s been a great year for Houston student athletes, they had to fight and give it all for the success they earned. The students are a true definition of the city, with everything that happened this year, the ups and downs they staid Houston Strong. The 2018-2019 season is something to look forward to.